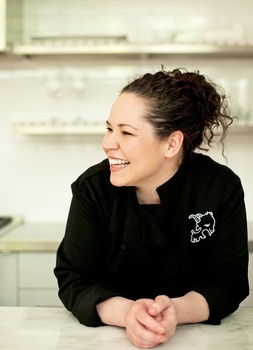 Standing tall inside the kitchen of Girl & the Goat, one of Chicago's most popular restaurants, is chef Stephanie Izard, '98. As she calmly directs employees through dinner service, some patrons snap photos on their camera phones, some come up and ask for autographs, and others just sit in awe, distracted only by arriving meals. Even in Chicago's saturated market of celebrity-run restaurants, Izard is a darling-giving off a vibe of accessibility and regularly participating in charitable food events. A graduate of Arizona's Le Cordon Bleu, Izard ran a restaurant in Chicago's Buck town neighborhood until 2008, when she participated in Bravo's "Top Chef." The reality show pits chefs against each other in culinary challenges, and Izard was the show's fourth-season, and first female, winner. This only increased public expectation for her next venture. Izard didn't disappoint. In July 2010, she opened Girl & the Goat in Chicago's West Loop neighborhood to great acclaim. Attention has been paid: Food & Wine magazine named her a best new chef and the James Beard Foundation named the restaurant a finalist. Now Izard is on to her next project, a book titled "Girl in the Kitchen: How a Top Chef Cooks, Thinks, Shops, Eats and Drinks" (Chronicle Books, 2011, $29.95). "I often don't measure out ingredients, but I was forced to," she said. "I now have more appreciation for the cookbooks that I own." She travels the country this fall on a book tour, dubbed "The Goat Tour" (follow her Twitter @ stephandthegoat for updates). She will cook with local chefs, and proceeds will benefit Share Our Strength, a nonprofit that fights childhood hunger in the U.S. In spring 2012, Izard plans to open The Little Goat-an all-day diner where she will offer cooking classes-down the street from its flagship. Does she plan to open another Girl & the Goat? "I don't think so," she says. "It's great to just have the original."